I'm not as confident in the Celtics as I had been at this time last year. This isn't because I believe the Celtics have lost a step from last year, but more so because I feel like other teams have stepped up their games. Last year the Celtics coasted to the best record in basketball and home court advantage. This year, the Celtics most likely won't be able to pass the Cavs for the top spot in the East and the Magic are nipping at their heels for the number 2 seed. This is mostly to blame on the lengthy injuries, most notably to Kevin Garnett. Doc Rivers is wisely taking no chances with the health of his stars with the division locked up. Having KG at 100% is more important than seeding or homecourt advantage. I think regardless of their seeding, the Celtics should get into the Eastern Conference Finals, but taking down the revitalized Cavs is a pretty tall order. A-Rod did the smart thing and decided to go with the Andy Petite route rather than the Bonds/Clemens route of simply denying the evidence stacked against them. Does an apology warrant any level of forgiveness for poor ole Alex, caving to the immense pressure of the expectations placed upon him when he came to the big leagues? I don't think so, but it does count for something. Sports Illustrated is reporting that Alex Rodriguez tested positive for steroids in 2003. I'm a bit conflicted in my feelings about this. As a Red Sox fan and Yankee hater I feel a great amount of schadenfreude to see their star player taken down a notch and showing once again the shallow nature of their success. As a fan of the game of baseball this makes me very sad. I had said in previous posts about Bonds that I was glad that A-Rod would break Barry Bonds' record and baseball would again have a legitimate Home Run King and in the process bring some dignity back to the baseball record books. Unfortunately, it seems that the tarnish of the steriod era of baseball won't come off so easily. At long last the Red Sox and Sox Captain/Catcher Jason Varitek have agreed to a deal. The deal brings Varitek back to the Sox for 2009 and includes both a club and player option for 2010. The club option allows them to bring back 'Tek for the 2010 season for $5 million and the player option allows 'Tek to return for $3 million and a possibly an additional $2 million in incentives. You'll notice Zaun played fewer games, but had a higher batting average and OBP than Varitek. Given the similarities between the numbers on these two and the disparity in the deals they got I think it's fair to say 'Tek's offer was generous and enough to allow him and his agent to save face after foolishly declining arbitration. This wasn't an awful deal for the Red Sox as everybody knows that Varitek's marketability is his intangibles such as his work with the pitchers and leadership in the clubhouse. I'm personally glad this matter has finally been resolved. I do have a soft spot in my heart for long suffering teams, (Prior to 2004 I could easily relate) but only when that team has a fan base that's suffered with them. In the last World Series nobody could deny that the Rays had an awful run up until that season as a franchise, but the Phillies had suffered through some pretty awful seasons and their fan base for the most part stuck it out with their team. The Rays could not sell out a game at their stadium until they made the playoffs and all of a sudden a fan base crawled out the woodwork with their recently purchased Mohawks and Evan Longoria jerseys acting like they had been following this club from day 1. When it came time to decide who I was backing it was no contest. The Cardinals aren't quite as bad as the Rays, but seeing them in the Super Bowl after they rolled over for the Patriots late in the season doesn't sit right with me. If they actually gave it their all in that game they don't deserve to be playing in the Super Bowl, if they phoned it in during that final game it's bad sports karma. I think the Steelers are by far the superior team and see a solid win for them Steelers 17 Cardinals 10. In case you missed it, BC head coach Jeff Jagodzinski was fired recently for interviewing for the vacant Jets job. BC's feelings were hurt that Jags had bigger aspirations than being BC's head coach for the forseeable future. I can't say I'm overwhelmingly disappointed. Jags was a solid coach that brought them twice to the ACC Championship game, but the Eagles were a pretty good team before Jags got here. I think Jags is a long shot for the Jets job and is probably only being considered because of his connection to Brett Favre from Green Bay. In all likelihood he'll pop up as a coordinator somewhere. After a quick search BC has decided to promote long time BC defensive coordinator Frank Spaziani. I like this choice as coach. Spaz picked up the pieces when Tom O'Brien left for NC State and coached them to a win in the bowl game that year. I have always felt that BC's defense was the true strength behind the team, holding their own against even the toughest of opponents. Perhaps his coaching style won't translate well to the offensive side of the ball, but you can never be sure when it comes to coaches. 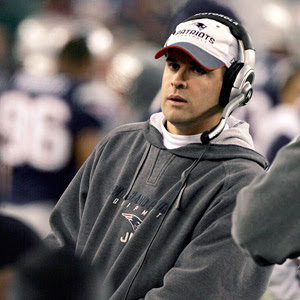 It has been confirmed that Patriots offensive coordinator Josh McDaniels will head for the snowier pastures of Denver to take over for Mike Shanahan as the Broncos head coach. McDaniels will have some big shoes to fill to replace Shanahan, who spent 14 years in Denver and brought home back to back championships in 1997-1998. One of the biggest questions surrounding McDaniels is his experience. He spent two years as the Patriots offensive coordinator picking up after Charlie Weis left for Notre Dame. The results posted by the Patriots offense in his first year as coordinator were staggering and quite respectable this year given that the reigning NFL MVP went out for the season in the first quarter of the first game. These results are pretty impressive, but how much is due to McDaniels and how much is due to Wes Welker and Randy Moss coming to town? It's really impossible to say definitively, but I'm leaning more towards the latter. In recent weeks we've seen how a number of Bill Belicheck's former coordinators have performed in the head coaching positions with Eric Mangini and Romeo Crennel losing their jobs as head coaches. In all likelihood, the only reason Charlie Weis still has a job at Notre Dame is due to the large contract they extended to him. This year the Fighting Irish went 6-6, the minimum required to be eligible for a bowl game. The Browns haven't soured on the Belicheck coaching tree as they've opted to hire Eric Mangini as their new head coach. I'll be curious to see how McDaniels does in the big chair after only two years at the coordinator position.